Serves me right for not writing it out in Word first. Crap. I've been off the Aether-Net for a bit. One of the tertiary cams on my difference engine bent, metal fatigue most likely. Luckily my brother is and informational technologies electro-smith, and was able to combine the best components of mine old engine with those of a second. The new and improved Old Guard difference engine is capable of far greater computational speed and power. The hammers just ring! New posts will soon follow. Up the Irons! The Dwarfs of Folklore vs the Dwarves of The Game. 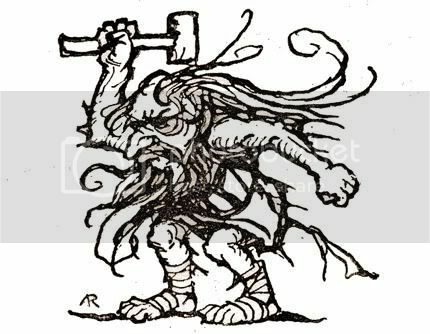 Along side the PC available Dwarves, I’m including the Dwarfs of folklore as monsters, (little m), cause I dig that black fairytale vibe. These are the venal, unpredictable and generally no good hairy little men who take advantage of lost travelers, trick the innocent into bad bargains, and steal young women and children who wander unprotected. Dwarf of the Wild Wood. Alignment: Chaotic Neutral by default, but may be any non-good. Size: S, variable, 2-4 feet tall on average. A lean and gnarled little man, with an avaricious leer and a sardonic glint in his eye, a dwarf of the wild wood is the last person an adventurer in a tight spot would hope to see. Cunning and venal tricksters, the dwarfs exult in taking advantage of those whom they chance to find in dire straits. In fact, chance often has little to do with the encounter, as dwarfs lay traps and dig pits to capture the unwary or reckless traveler. It is the dwarfs practice to deny responsibility for the trap, and to offer aid to the unfortunate, but always at a great price. 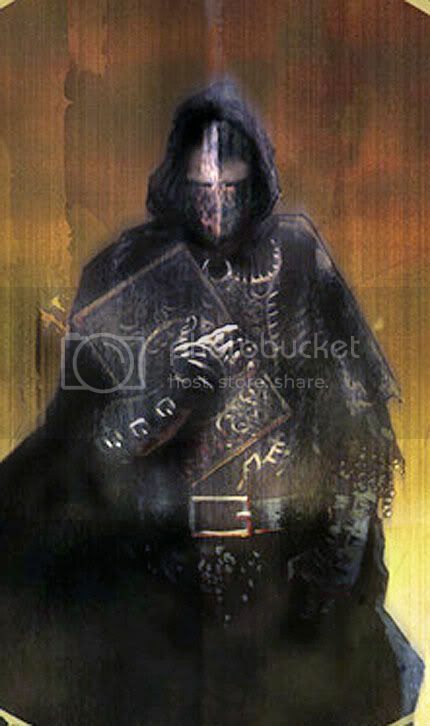 They will require the victim’s word that he will not go back upon the bargain struck, and though the dwarfs have no sense of honor themselves, they are also bound by the literal words of the deal, and must also abide by it. If an adventurer should manage to gain a position of advantage or at least of equality with a dwarf, he may be able to reach an agreement by which he may gain a great deal. The dwarfs are peerless crafters of metal and workers of inherent magic. Though not mighty spell casters, dwarfs are able to imbue great magical power in the work of their forges and furnaces. Jewelry, weapons and armor produced by dwarfs are often items of nearly artifact level puissance. Dwarfs are also quite knowledgeable in areas of dark and hidden wisdom and may be consulted as though they were sages concerning subjects which a prudent adventurer may not wish to openly inquire after. Of course, a dwarf will drive a very hard bargain before providing such lore, and may leave out information which could prove deadly to the incautious. Let the buyer beware who chooses to do business with a dwarf. A dwarf will rarely choose to engage in direct melee. Though dwarf made weapons can be fearsome, and the armor they craft formidable, they have little liking for putting themselves in danger. If seriously threatened, it is likely a dwarf will use his innate ability to Vanish. In a flash, or with a stamp of his foot, or by stepping into shadow, a dwarf may remove himself from a location of immanent danger once per day. This may function in a manner analogous to Dimension Door, Teleport, Passwall, Meld with Stone, or other standard spell as the DM sees fit. A dwarf also possesses the power of Misdirection. A dwarf may divert the attention of those who fail to Save VS Spell by insinuation and inference once per day. In this manner a dwarf may cause others to change their plans or act in a way which advances the dwarf’s own agenda at the expense of their own original course. 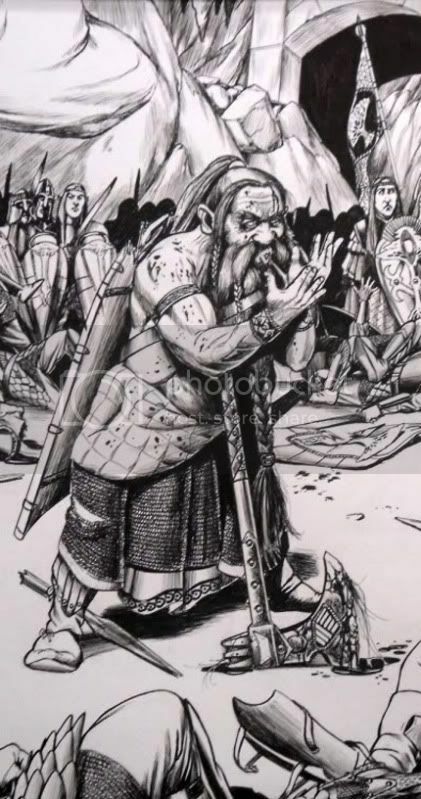 As an example, Migrud, the dwarf who dwells near the wells of Ohlam, through Misdirection caused Sir Holgruh, Brulm of the Heavy Hand and Yeilasnia the Sharper to abandon their intention to seek the Wyrm’s Band, and instead confront the caravan of Mehulude at the Hoarnung ferry. This action allowed Migrud to steal the daughter of Mehulude in the confusion. Though the knavery was found out, to the shame of all involved, neither the dwarf, nor the girl were ever seen again. Dwarfs are nearly always encountered as lone individuals as they are too paranoid and untrustworthy to often live in groups. If a group is encountered it is likely they are working a mine or managing some other source of wealth which requires at least some teamwork to acquire. Encountered dwarfs are always male, it is uncertain that there even are female dwarfs and it is hinted darkly that this lack is the reason for the dwarf’s predilection towards woman theft. Dwarfs vary in appearance and size, with skin often nut brown, sometimes black, and sometimes pale white. They have long and wild beards and unkempt hair. Dwarfs may dress in the height of fashion, or they may appear in filthy rags. In no case is it safe or wise to judge a dwarf’s prowess by his appearance. Dwarfs tend to inhabit areas that are wild and uncharted, but near to a civilized land. They live in caves and mines, build huts or shacks in deep woods, or lurk close by waterfalls or riverbends. Dwarfs are always aware of the passage of travelers through their land and watch avidly for the chance to gain by the misfortunes of others. If it is necessary to manufacture this misfortune then to a dwarf, so much sweeter is the gain. Anything that becomes popular for any length of time tends to move further and further from its point of origin as the facets of it which attract the most attention are magnified by public perception and feedback on the original. Most things, art movements, political positions, musical styles, The Game, become self-referential at some point and move away from whatever originally attracted the majority of fans to them in the first place. Getting at the root of The Game, and from that point considering and testing the directions in which it wasn’t explored is a big part of what the OSR is for, in my mind. Alongside with, and complementary to, building my personal iteration of Greyhawk , I’m revisiting the basic elements of the game to find their origins and see what happens when I look at them from a different direction. Just like the rest of you. So, dwarfs. 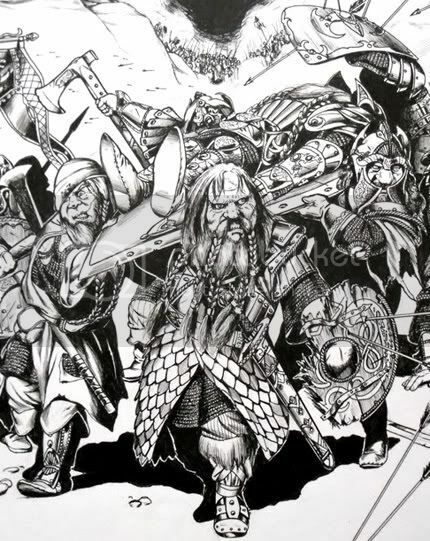 OD&D dwarves are largely Tolkien dwarves. The good professor humanized the dwarfs of folklore and fairytale and turned them into an organized and non-human, but relatable race. They have their own motivations and desires, but they reflect facets of human nature, stubbornness, greed, inflexibility, etc… the same as the orcs represent war on nature, militarism, destruction for its own sake. As The Game has changed with new editions and materials, so have the portrayals of dwarves in The Game also changed. OD&D dwarves were, after the Tolkien version, non-magical, technologically oriented, stolid, hardworking, and unforgiving. There really wasn’t all that much written about the dwarves culture, but it was natural to default to Tolkien and to the cultures from which most of the original folktales he drew from, Scandinavian, Germanic,Celtic, English and so on. Of course, that cultural feedback loop starts up quickly as a thing grows in popularity, and the most prominent features of what was written about dwarves were amalgamated with the same prominent features of the northern European cultures they had their roots in, and commonly perceived dwarf game culture began to rapidly expand. Now, there is a sweet spot in the arc of development of whatever cultural fancy you want to talk about, where it is fully realized and detailed and distinct from its inspirational origin. After this point, caricature sets in, like gangrene, and the compounding stereotypes turn it into a joke. This shark-jumping occurs in every medium, and it’s pretty much unavoidable. 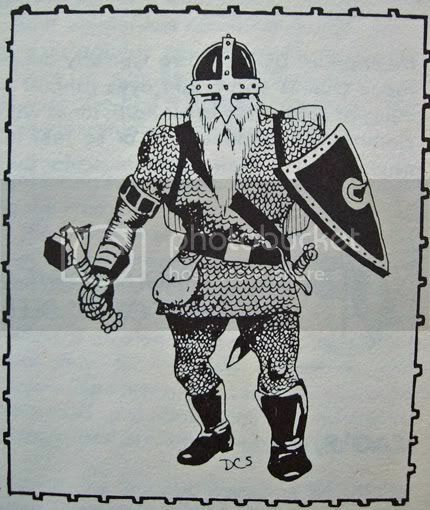 It’s hard to pin point when it happened, but suddenly every dwarf was Foamy Tankard MacTankard, hard drinking, grim, stubborn, but loyal warrior/iron worker of the Stony Iron Hammer Shield Clan. This is why there are renaissances. Of gaming, and otherwise. I’m not about to throw out the Tolkienesque D&D dwarves as PC races, I’ll just scrape off the cultural cruft and try and restore them to original condition so I can add new cultural cruft that’s in keeping with my own sensibilities. My favorite art depictions of pre shark jumping dwarves are always by Jim Holloway. This has a lot to do with the fact that Jim’s art has a sharp sense of fantastic realism and rough humor, as well as clean line work and good figure balance. 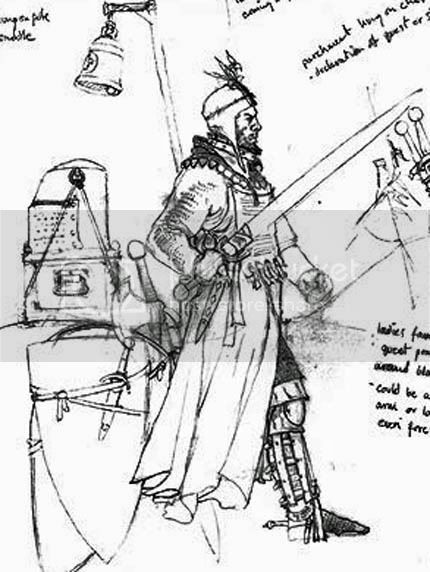 The armor and weapons he depicts are just slightly fantasized versions of real world examples and believable to me and that’s important to my view of fantasy. Spikes, straps and ridiculous oversized weapons just kick me right out of suspension of disbelief. 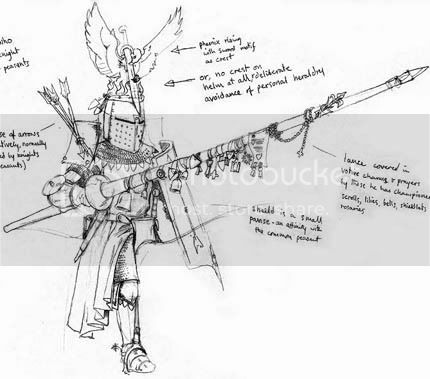 This will be my starting point for redeveloping PC dwarves for Wyrd Greyhawk. If I decide it's needed. As with the paladin, the players don't care that much, so this is just for me. And you if it appeals to you. 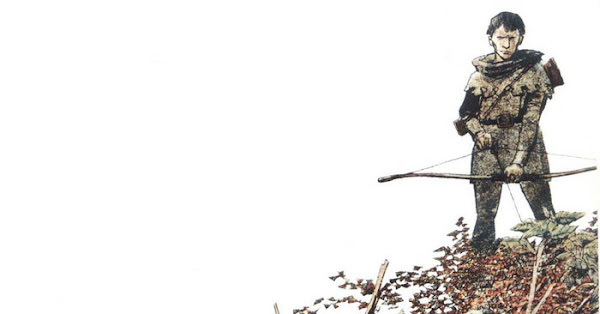 These last two images are close ups that I've clipped out of larger pieces by Holloway. The originals you may find in the Holloway art thread at Dragonsfoot. These are new art, not previously appearing in published D&D material. Mr Holloway is planning a book of new illustrations, and I'll be glad to see it. The top illustration is by Rackham, it's a small page decoration for The Rhinegold. The second image is a pic of Sutherland's illustration for the dwarf entry in the 1e Monster Manual. This is what I was listening to when I wrote the Wyrd-Paladin post. Dead Can Dance- The Chant of the Paladin.